Onpage Hero makes SEO simple. 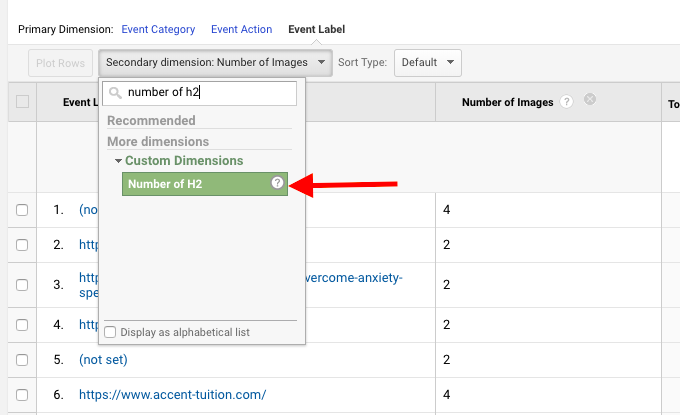 Today, we are looking at how to automatically find and monitor your <h1> and <h2> tags using the number of h1 and number of h2 Onpage Hero custom dimensions. 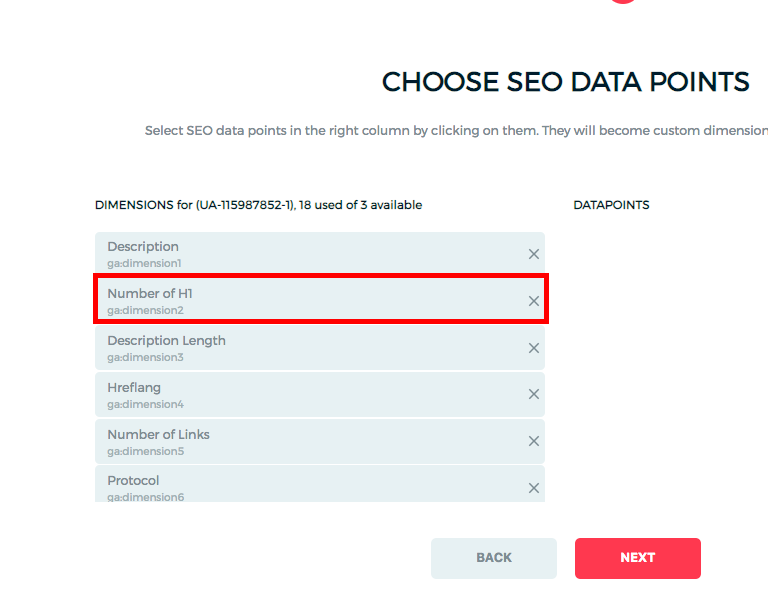 Firstly, make sure you have the number of h1 and number of h1 dimensions selected as part of your Onpage Hero plan. Free plans allow you to add up to 3 datapoints, whereas paid plans allow up to 20. The options on the left show the datapoints applied to this property. 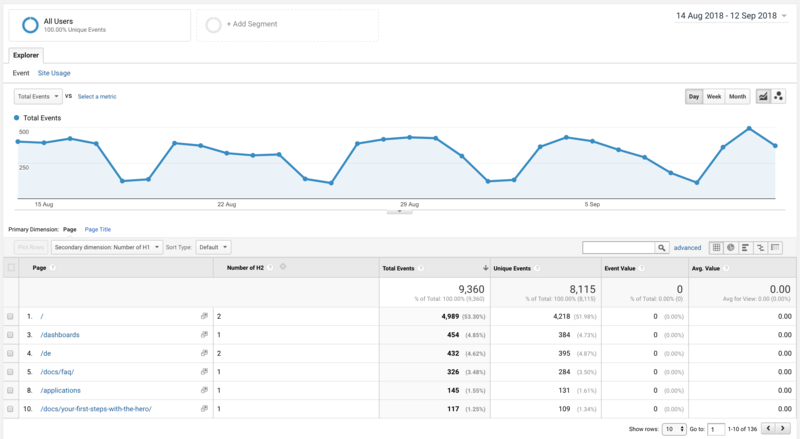 Select the dimensions number of h1 and number of h1, click NEXT, then VIEW ANALYTICS to jump into your Google Analytics property. What are header tags <h1> and <h2>? Header tags are HTML tags used to specify titles within your online content. Be careful not to confuse this with the <title> or the page title. Header tags span from <h1> to <h6>, from most important to least important subheading. 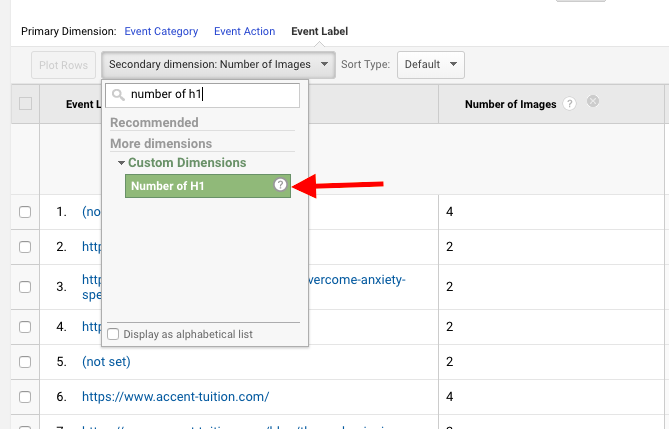 In Onpage Hero, the number of h1 and number of h2 custom dimensions allow you to see the number of <h1> and <h2> header tags per URL in Google Analytics. This is useful to ensure that there are no missing header tags which can be negative for SEO purposes. Why are header tags important? Header tags are used by search engines to understand the content of your page. They are used to structure data, making it easier for your users to read and for search engines to crawl and index. Missing or duplicate tags can lead to suboptimal search engine indexing. Add just one <h1> tag per page. Sum up your page in one concise sentence. Try to have one header tag at least every 300 words to make your content user and SEO-friendly. Ok, let’s take a look at our page titles first. So type “number of h1” as a secondary dimension to display the results. The first thing to check is that there are no missing h1 tags. There should one <h1> set for each page. As we can see from the results, some pages appear to have more than one <h1>. If you find any duplicate <h1> tags, make sure to update each page so it only has one. Next up, let’s take a look at the number of h2 tags. Add “Number of h2″ as a secondary dimension and view the results. From the results below, we can see that all the pages we analyzed have at least one <h2> tag. A logical next step is to check those pages with very <h2> tags to ensure that there are enough headers to structure the text. For example, if you find that a page has a word count of 1500, but only 2 <h2> tags, you should consider adding more. Onpage Hero has a nifty custom dashboard that displays <h1>, <h2> tags and word count side-by-side. At a glance, you can detect missing or duplicate <h1> tags and see if you need to increase the number of <h2> tags based on word count. 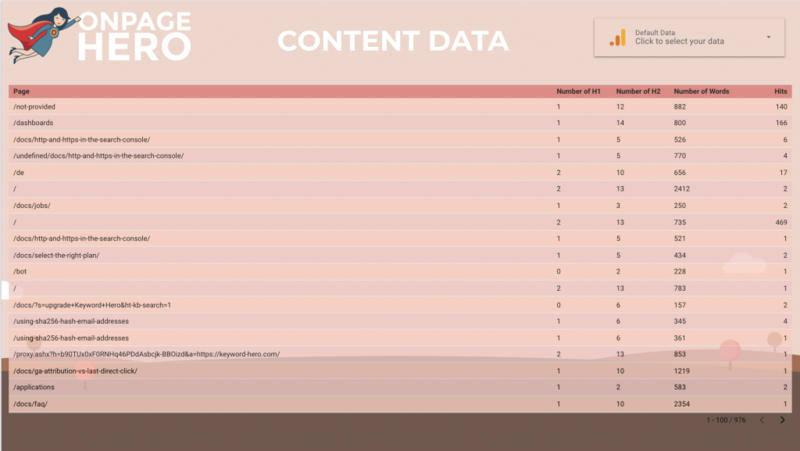 Head over to our dashboards page and import the Content Data Dashboard. Again, we have some work to do. We quickly have identified an issue that our <h1> tag is being duplicated on certain pages. Our number of <h2> tags seems reasonable compared to the relative word counts. Next up it’s time to optimize your word length.